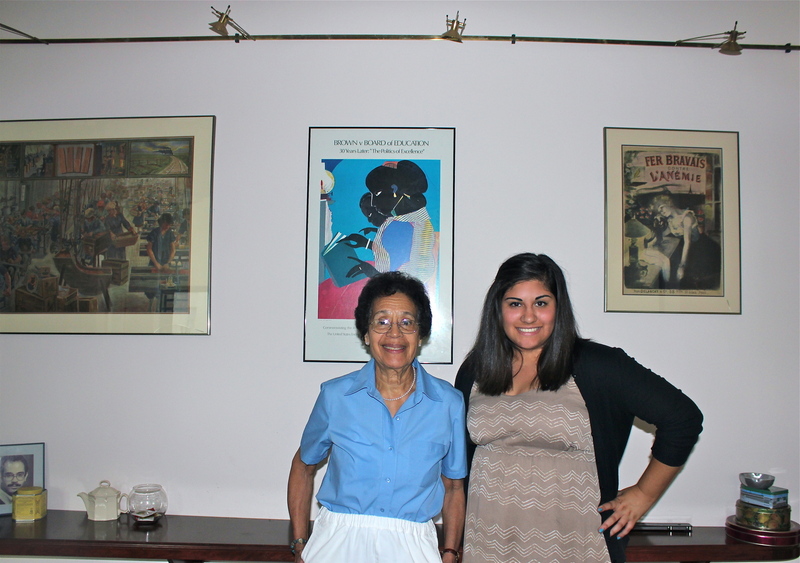 Lauren and Alexis conducted an oral history interview with Evelyn Jones Rich, the first black undergraduate student to reside on Bryn Mawr's campus for her entire four years, in July, 2013. 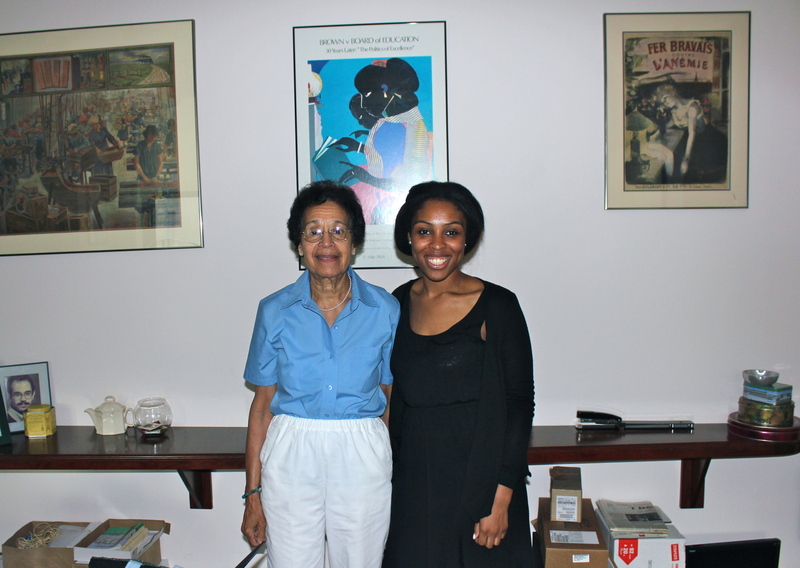 Through this conversation and the time they spent archiving her papers, they learned the story of Rich’s life both at college and beyond Bryn Mawr. This page features highlights of Rich’s college experience and how it informed her later life; a recording of the interview can be found at the bottom of the page. 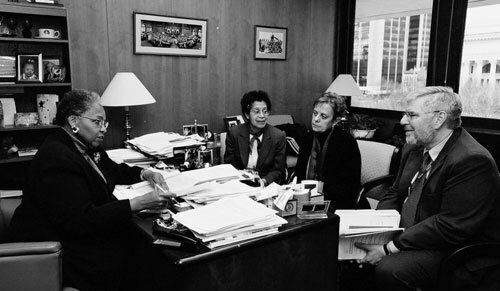 Rich accepts that she was never a success at Bryn Mawr College from the administrative perspective. She reveals that she came with her own agenda as a student. She joined the Students for Democratic Action organization as a freshman, which was liberal organization that wanted to change society. She felt accepted by the group because of their common beliefs, and she did not feel marginalized because of her ethnicity. In order to understand the society around her, she went to any and every extracurricular event at the college (sometimes at the expense of her academics). She never missed class, and seized every opportunity for success. She saw things at the college she did not agree with, and wished to create change. Her mother told her “change doesn’t come overnight, and you must change the foundation,” which is what she attempted to do with the tools she learned at Bryn Mawr. Rich remembers that she did not fit into White Anglo Saxon Protestant society. She was set apart from the majority of her classmates by the fact that she had received a public education and came from a poor background, and she knew that she was not accepted because of her identity. Prejudice and racism were common among the people that she interacted with every day, and the sense that she was being graded unfairly by her professors left her feeling bitter at graduation. She found a refuge in the maids and porters with which she developed close relationships while living in Denbigh. Rich would often visit them at night to play pinochle on the top floor of the dorm. However, she found that these friendships with the black staff caused tension with the other community members. Bryn Mawr provided her with the tools she needed to become successful in the future. She explains that administrators didn’t understand their own views as racist, and they probably would have rejected the thought of it. She also boasts that she was able to remain confident while enduring times of adversity. Rich was happy that she learned how to accept defeat, pick up and move on, solve money problems, address issues with men on how to interact with people from different cultures, speak effectively, and how to achieve the outcomes she wanted. Most importantly, she “learned how to say what [she] want[ed] and live with the consequences.” Due to these experiences, she learned she could not be in a relationship with a man where her self-esteem and sense of worth was diminished. She views herself as an educator, though she felt forced into this career path because positions in education were common for blacks to take. She had a hard time finding a job after graduation, and eventually became a public welfare investigator. Rich has worked with Americans for Democratic Action in Philadelphia, a New York socialist activist group, and Carnegie Endowment for International Peace (as a secretary). 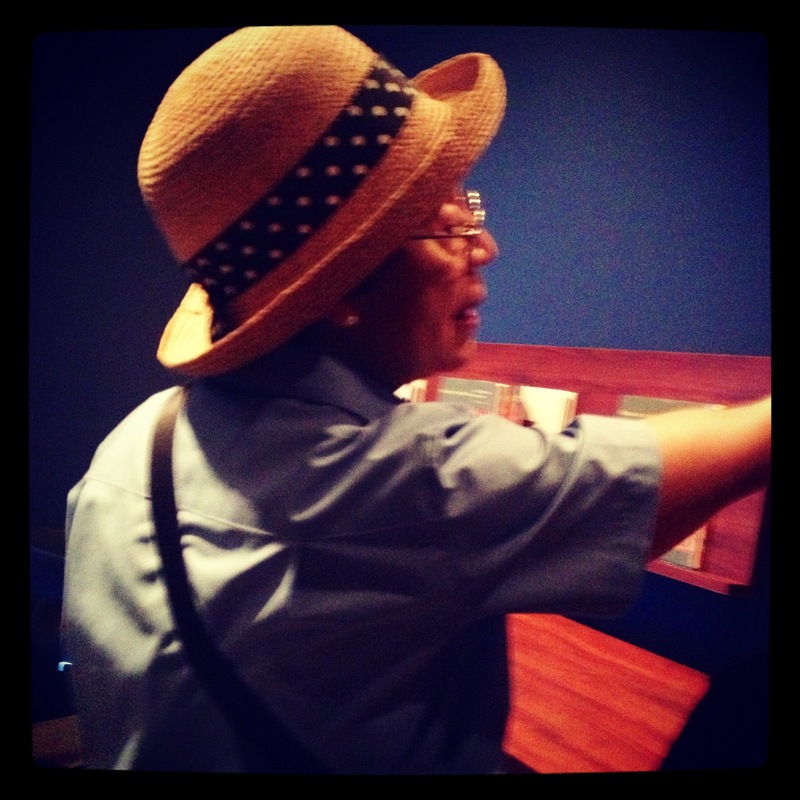 She took 5 years off because of the birth of her son and was active in civil rights along with her husband. Rich says that having only one child was a deliberate decision for her, and she later became a teacher in order to help the family meet their financial needs. She sees the role of an educator as a broad one: to help people understand our society, with a motive of enacting change. This philosophy was in tune with her personal ideals. She aimed to make changes in the educational system, which she knew she could achieve by working inside the system. Rich did want to be a politician, and to run for Congress in her district—however, she also saw the limitations in this path. Rich wanted a job in a major American cooperation, so she attended a business program at NYU. She knew that she wanted a line position so that she could make decisions that had impact, rather than just carrying out mandates in a staff position. She became the Executive Assistant to the superintendent of high schools of Queens, selecting teachers for the regional schools. There were only two black women, including herself, in this type of position. Without her Ph.D., Rich speculates that she never would have gotten the job. The experience proved to be a test of endurance. Rich says that black women from Bryn Mawr will have a hard time making it. She is a black feminist, and does not feel that white woman give black woman enough support even though black women provide them with support. She often felt as though her white friends did not offer her as much support as they were able to. Also, to that extent, she does not feel black women at Bryn Mawr support each other enough. She gives money, time and commitment to the institution because the life she lives now is due to her education at Bryn Mawr—Rich said that “sometimes you win when you lose.” She states that she would help any black Bryn Mawr woman in any way because when she needed the help it was not there for her. There is a noticeable difference on campus today at Bryn Mawr, but it’s not that great: she does not think that the administrators recognize that their views carry some of the same tones of racism as those who governed the campus when she was here, and thinks the notion would be rejected if she were to tell them so. Rich observes that Bryn Mawr can impart a sort of arrogance, develop and refine it. As a student she was told that being black and a woman was considered being a nobody. Later she always taught students what she learned at the College: how to think creatively, how to speak, how to solve problems and cope with the problems of life. She believes that her Bryn Mawr College experience was different from what it seems to be now on campus, but although there has been change, it is not as much as she would hope for.